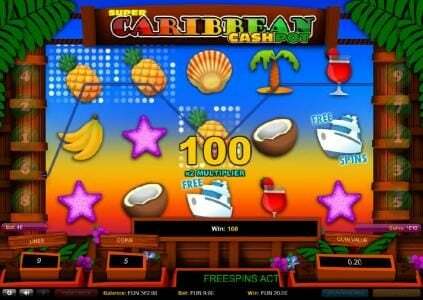 Super Caribbean Cashpot Slots has not been reviewed yet, be the first to rate this slot. 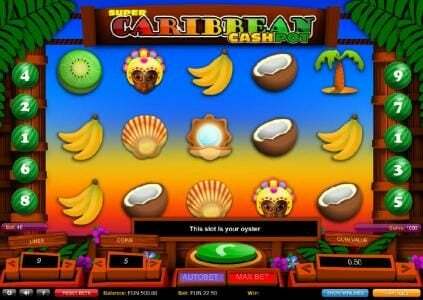 1x2 Gaming takes players on an unforgettable vacation through their 5 reel, 9 payline video Slot “Super Caribbean Cashpot”. 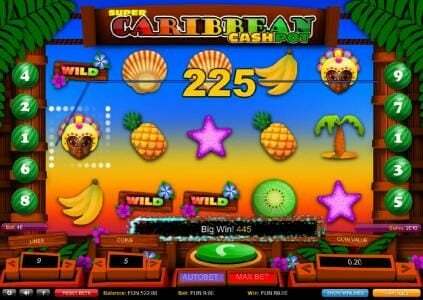 This slot takes place directly into a tropical destination and has an adventure of a lifetime waiting. 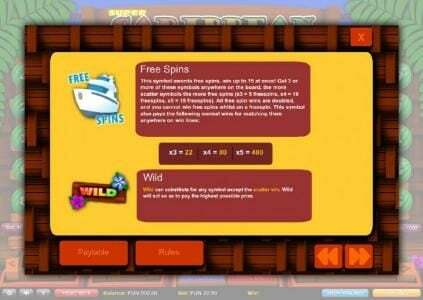 On that adventure wild symbols, free spins and multipliers will make an appearance. There is also a $27,000 jackpot offered as this games top payout. 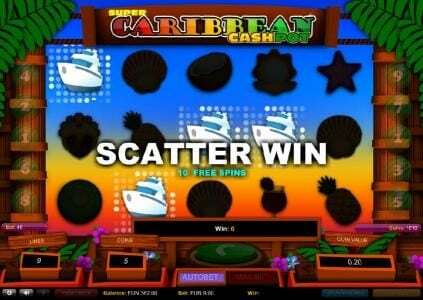 When first playing Super Caribbean Cashpot what is noticed is how both the background and reels work together simultaneously in order to bring credibility to its tropical theme. 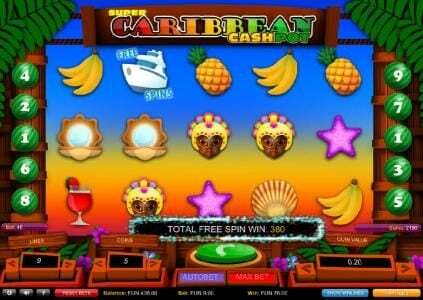 The payline numbers are designed Watermelons, large palm trees will be seen over the paylines while an amazing sunset is shown in the lower part of the slot such as watermelon, coconut, bananas, lemons, pearls, palm trees and masks appear to enhance this theme to another level of realism. 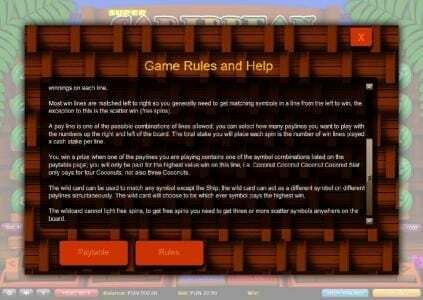 When making a wager for the first time through this slot players will be pleased to find out that the maximum bet doesn’t require a large bet as it permits bets from as low as $0.09. Of course the option for larger wagers is there with the max being $4.50. 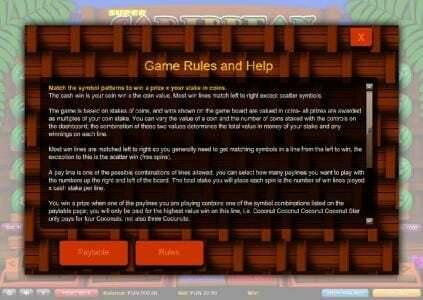 The free spin feature is simple in its design as well. To activate this you need three or more Cruise Ships. The number of spins won depends on the number of cruise ships present, three earn 5, four awards 10 and five will see 15 free spins awarded. All spins that see a win achieved will have payouts doubled. It’s take to take a vacation and have an incredible time doing so, then this is one for the books. The graphics themselves are basic but often, it is the simpler Slots that often have the best results. 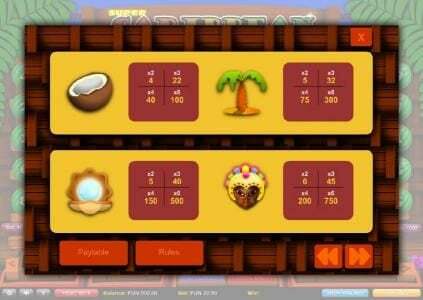 The added ability to win a higher number of Free Spins is a nice point that can lead to some pretty wins and therefore makes this one a nice slot overall.